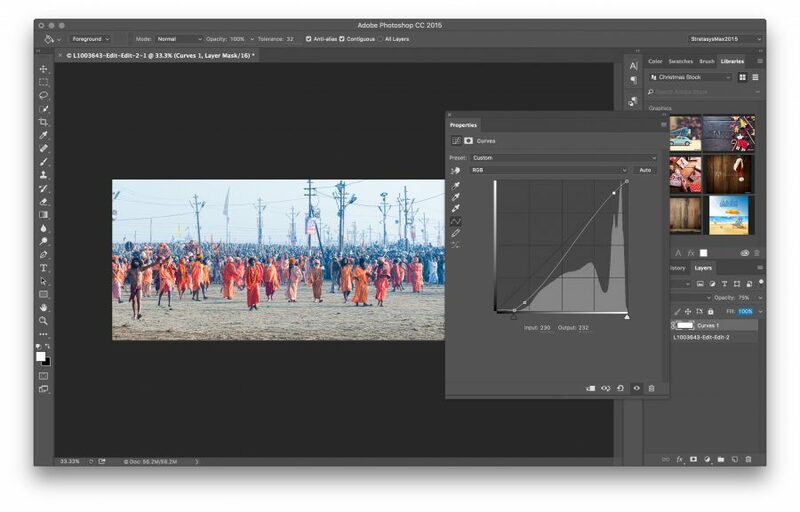 In his latest blog Richard Curtis of Adobe explains how to set white and black points using levels and curves Photoshop. This will be Keith’s first opportunity to show his undoubted skills to members of the Digital Group and I am sure he will be well supported. Just a reminder that Richard Curtis will be with us in the main hall. Richard is Principal Solutions Consultant for Adobe Europe and as he showed when he visited us in November 2014 he is well worth listening to. We have promised him a full house so make sure the date is in your diary. Richard shows ways to use Adobe Stock which you might find useful. Subject: Photo For the Digital Group. Requires no high speed shutter. Create a mini studio on a solid base. Set camera timer to 10sec run out of the dimly light room. Adjust flash power and aperture for exposure. More defusing (Kitchen Towel) on main flash heads will soften the shadows. If you are stacking, this is achieved by sliding the camera along the Arca Swiss rail using the printed scale. The final image was created with filters in Photoshop (background only) the butterfly was masked off and remains untouched. Set one of the main flash heads 1-2 stops higher than the other to create shadowing and visual depth. Backgrounds must be non resin coated paper. Please find a piece from David Harris on Macro and Close-up photography. This is dated 2013 but is still relevant .I hope to get some notes from Ross following last weeks demonstration. Movement At high magnification, the slightest movement of the camera or the subject will blur the image. If possible the camera should be mounted on a sturdy tripod or, if low down, on a bean bag or similar. If the camera is handheld or there is any wind to speak of, high shutter speeds will be needed. Depth of field The depth of field in macro photography is often extremely limited, sometimes a fraction of a millimetre. To maximise depth of field it will usually be desirable to close down the aperture. (For 1:1, depth of field goes from 0.8mm at f5.6 to 2.1mm at f22.) It may also be necessary to compose the subject in such a way that the elements to be in focus fall, so far as possible, in the same plane. Lighting Good lighting is necessary both to show the subject to best advantage and also to allow the lens to be stopped down without resulting in an unacceptably slow shutter speed. However, the closeness of lens to the subject will probably exclude the use of on-camera flash. Dedicated macro lens Specifically designed for close-up work. Generally come in three focal lengths ~ 50mm, ~100mm, and ~200mm. The longer the lens, the greater the stand-off distance (good) but also the greater the expense and weight (not good). Straightforward to use. Most macro lenses make excellent portrait lenses (but not the Canon MP-E65). Supplementary lens Cheap alternative – a magnifying lens that screws onto the filter thread. Some loss of quality is normal. Teleconverter Fits between the lens and the camera body, and relatively light and cheap. 1-2 stops loss of light. Reversing ring An adaptor that enable the lens to be reversed with complications to manage! Coupling ring Joins two lenses together, one reversed on to the other making the reversed lens a high power supplementary. Some challenges. Extension tube Probably the favoured option, if a macro lens is not available. Often sold in sets of three, and best with relatively short lenses. An extension of 50mm enables 1:1 to be achieved with a normal 50mm lens. Bellows Same principle as extension tubes but fully variable. Cumbersome, but can provide extremely high magnification ratios. Macro flash Ring flash or twin units mounted on the front of the lens. Focusing rail Fits between the camera and a tripod or other fixed mount and enables the camera to be moved very accurately forward and back and side to side. See section on Focus Stacking on next page. 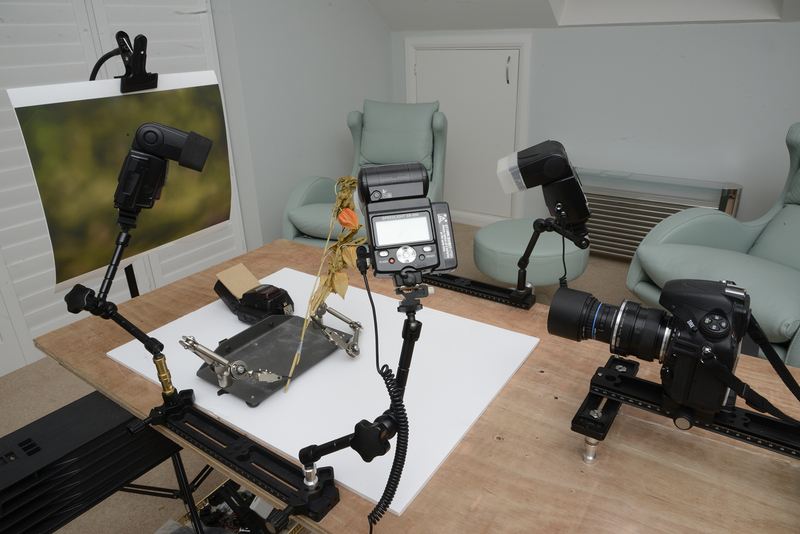 Flexible clamps Invaluable for holding subjects in front of the lens in a pseudo studio setting or outside, and also for stabilising flowers etc. in breezy conditions. The usual rules of thumb about composition apply, as do the requirements for the category of image you have in mind (wildlife/natural history, visual art, other). Think about what you are trying to portray. Try to isolate your subject from all but the essential background elements. Approach insects slowly, and learn by trial and error what they will tolerate. Try using a gentle clamp attached to a tripod to fix the position of flowers and grasses wafting in the wind. Use spot autofocus judiciously – it’s generally the eyes that have to be pin-sharp. Manual focus with controlled body-swaying through the focal plane may give you more control. Bright direct sunlight can be very hard to manage: shadows, burnt-out reflections and colour washout being the most common snags. Direct flash (macro or other) can produce bright reflections on shiny insect wings and bodies. Ambient light on a bright but hazy day is best if you can balance the other parameters. RPS expert John Humphries suggests 4 software options. I use Photoshop CS6 and cannot vouch for the others. The subject must be completely stationary during the image sequence. A tripod and mount for the subject are recommended. Focusing adjustments can be made using the focus ring of the camera, or by moving the camera on a focusing rail which can give very fine control. Focusing rails come in a range of sizes, starting at around £45. Fancy computer-controlled tracks will cost £100s. Be aware of the slight change in perspective and the relative positions of the elements in your picture as the point of focus progresses. Even powerful software has its limitations – complex, deeply separated, sculpted or filamentous 3D shapes can change in perspective between each step of the stack and give the programme mapping conflicts that are impossible to resolve. Don’t expect miracles of blending. Focus stacking is processor intensive and stacks of complex images or large numbers of images may well take a while to process. I have blended over 40 images at a time, but this is rare – typically, I combine 15-25 images. It is possible to use focus stacking in ‘normal’ (e.g. landscape) photography, but use of a tripod or other mount is well-advised. In Bridge (or LiteRoom) select the set of raw images you wish to combine. Make any adjustments you wish to the Basic, Tone Curve, Detail etc sliders on the right panel. Changes to these will be automatically synchronised across the entire image set. Make any further adjustments using the tools on the horizontal toolbar to any individual images. If you want the same adjustment on all images, click Select All, click Synchronise and in the new window click on ‘local adjustments’ at the bottom of the list, then click OK.
Make sure all images are selected and click Open Images. In Photoshop, wait for the images to open. Click on Add Open Files (they are listed in the window), then click OK. Photoshop opens a new Untitled file and places a copy of each image as a separate layer within it. Select all the layers (highlight the top one then Shift+Click on the bottom layer). In the Edit Menu, select Auto-Align Layers, select Auto in the window and click OK. Wait for alignment to be completed. There may be some repositioning and stretching/squishing done to optimise alignment. In Edit Menu, select Auto-Blend Layers, select Stack Images and click OK. Wait for blending to complete – it can take many minutes depending on the oomph of your computer processor and the challenge presented to Photoshop. When the blend is complete, the parts of each layer used are whited out on the stack on the right. The combined image is a .psb type. It will need to be ‘merge layers’ managed and cropped – there may be some weird effects round the edges from the alignment stage. The blended image can be ‘mended’ by cutting and pasting bits from individual images if you feel you can do better than Photoshop! Please find below a link to the latest Richard Curtis blog concerning super sized images in Photoshop. David and Ross join together to demonstrate close-up and macro work with particular emphasis on preparation and equipment. A recent trip to Mongolia sent time with the Eagle Hunters and Nadaams, here is my short portfolio of the trip (All made with Adobe Slate). Why not make your own and see how easy Adobe Slate is to use.